I suppose many of us could say we were deprived as children. Thing is, I was. I really was. My mother was deathly allergic to garlic. One taste of garlic and the results were not pretty, but they were immediate, chunky and urgent. So, in grade school, every other week on Wednesdays we had spaghetti and meatballs and garlic bread. The pasta? Uh, so what. The meatballs? I would have preferred a burger. But the garlic bread? That glorious bread. Once I got married, I began to have garlic bread at home. Once I got married the second time, to a brilliant cook and bread baker, well, my life is just fine now. Just fine. Of course, as a kid, my mother served cream cheese on crackers and melted cheddar on apple pie and that was our cheese universe. 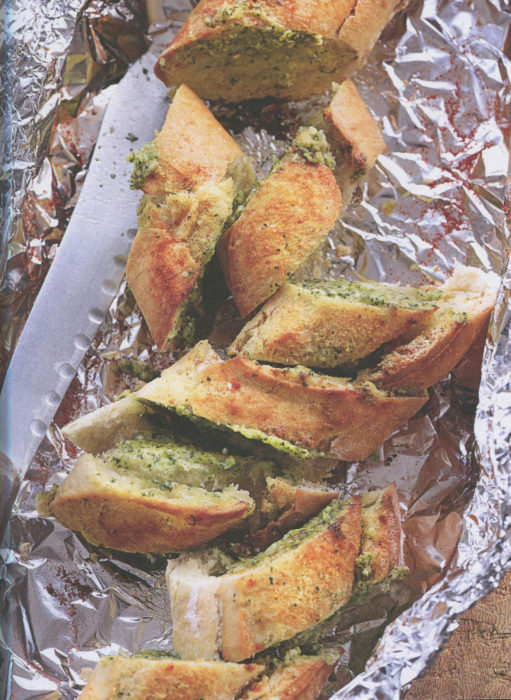 This recipe, garlic bread steeped in cheese, is my happy way of securing garlic and cheese revenge. Not that my mother was a bad person but … Actually, it’s complicated. Let’s just say I soothe my soul now with garlic and cheeses of all kinds. This bread almost demands you wear a bib. Enjoy with a salad and a bottle of red or white. It can be a meal unto itself. Put all the filling ingredients in a blender or food processor and blend. Generously spread the filling between the baguette slices. Wrap the baguette loosely in aluminum foil, then place in the oven for 20 to 25 minutes, until the filling has melted. Remove from the oven, open the foil and sprinkle paprika. Leaving the foil on return the baguette to the oven for a few minutes, until the crust is golden brown.